"(1790) PENNY Albany Church Penny, D Above CHURCH VF35 PCGS. Breen-1170. One of the great coinage curiosities of the American colonies and the early federal period--ranking right alongside the equally enigmatic Higley coppers--are these communion tokens. Little is known of their origins. Crosby did not include them in his classic book on colonials, but they have become part-and-parcel of the series over the past century or so. 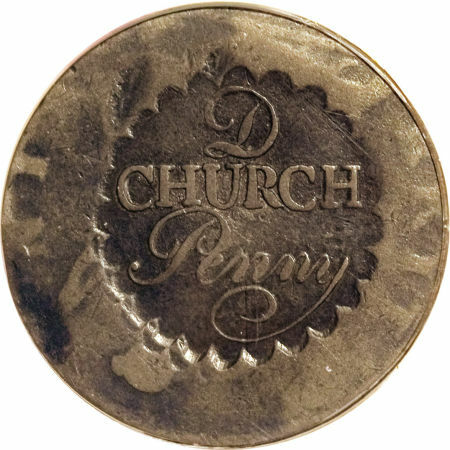 It is not even known if the Albany Church Penny was made for communions, but it is logical to presume so, for such pieces go back at least four centuries in the English series, many of which are extremely rare. Only the Scottish pieces are common, thanks to the fervency of the Scots as well as to their tendency to save everything. Not so the American church pieces. In fact, rarely did our colonial churches use these, as part of the tradition of each church member taking one upon entering the sanctuary on Sunday morning, using it for communion, and then surrendering it upon leaving the ceremony for the day. As Breen says in his Complete Encyclopedia, on page 131: they were both tokens and symbols of partaking in the service, and "therefore constituted a kind of proof of membership whose purpose was to prevent hostile outsiders (royal spies, etc.) from attending services and betraying members during the decades when all such unorthodox religious observances were illegal." He speaks of their use in England of the 1630s and slightly later, a period leading up to and during the English Civil War. The practice continued as a tradition for many years thereafter, and occasionally was taken up in the colonies. Certainly, Breen's comment about royal spies remained germane in the early American federal period of the 1790s. The state headquarters of early New York certainly experienced spying. But it has never been proven if this pertained to the Church Pennies of Albany. Church tokens were actually made for one of two uses: proof of communion, as Breen so aptly describes, or for placing in the collection plate, perhaps as a donative--a special gift, as at Christmas (representing a prepaid cash contribution to the church, as in tithing). The purpose of the Albany pieces remains unknown. Nothing is known, either, of the issuer or of the manufacturer of the Albany Penny. Perhaps it is better said that the maker is forgotten. As well, it is presumed that these tokens were of local manufacture, for so they appear by their texture. That they were used, however, is evident. All of the few known pieces are quite worn, and Breen even declares that grades are "irrelevant." 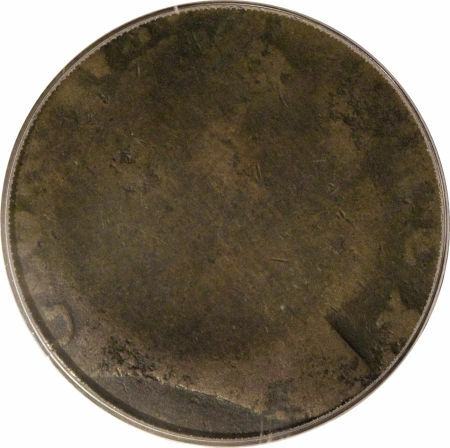 Maybe so, but not to the collector seeking a fine piece to represent this mysterious "coin" of early America. Why are they so rare? Given the worn state of the known specimens, it must be assumed that some perished, despite the users' tendency to preserve them. The ultimate reason, however, is that precious few were ever made to begin with. Churches of the era had small congregations, typically a few dozen members at any given time. Pieces are known with small counterstamps, and they generally fall into two classes--those with a large, cursive "D" above the word "CHURCH" and those without. The "D" probably stood for the British "Penny," an ancient abbreviation stemming ultimately from the Roman Empire's coin called a denarius, whose abbreviation was always the same letter. A penny was 1/12th of a silver shilling, a common commercial coin--money of "the populace" both in Rome and in early America. The surfaces are dark brown in the fields with significantly lighter brown over the highpoints. Here indeed is an excellent example of one of America's numismatic mysteries, fit for the best of collections and worthy of any."